New rules for Canada’s Express Entry immigration process put international students in a better position to become permanent residents. The changes, which took effect Nov. 19, are intended to attract highly skilled and educated candidates to the country, and that includes foreign students. 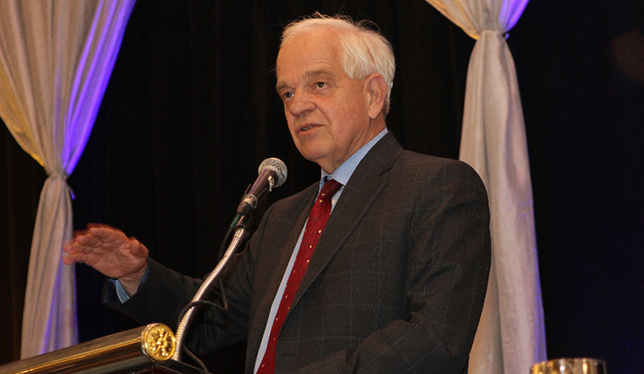 John McCallum, minister of immigration, refugees and citizenship, speaking at the CBIE conference in November. Photo by Dan Waters. The previous Conservative government introduced the points-based system in 2015 with the goal of matching skilled workers with employers. Under the new rules, there will be less emphasis on applicants having a qualifying job offer, and the process will give more weight to applicants with a high level of education, language skills and Canadian work experience. Once invited, applicants are now allowed 90 days to complete their application, up from 60 days. Previously, applicants could earn 600 points for having a qualifying job offer that was backed by a Labour Market Impact Assessment. A LMIA is no longer needed to receive points for job offers in certain professions, though international students are not likely to be working in those occupations. Job offers no longer need to be “permanent” but need to span at least one year, a change that will benefit workers such as tenure-track faculty, who were experiencing difficulties under the previous system. Because qualifying job offers earn fewer points now (from 50 to 200), international students with a work permit and perhaps an entry level job, but no qualifying job offer, have improved chances of getting permanent residence through Express Entry. Importantly, international students will now also receive 15 to 30 points depending on the length and level of education they’ve received in Canada. “The most significant success [for international students] is a recognition of their Canadian postsecondary education credentials. This is a direct benefit to international students,” says Diana Ning, associate director of international student and scholar services at York University. She notes that pathways to permanent residence that are integrated with Express Entry – the Post-Graduation Work Permit, Provincial Nominee Program, Canadian Experience Class and Federal Skilled Worker Program – also contribute to the efficacy of the immigration process for international students. The Post-Graduation Work Permit Program, through which most international students obtain work permits, is undergoing a review. The federal government hopes to improve the transition to permanent residence within the program. The number of work permits issued has increased steadily since 2009, but saw an eight percent decline in 2015. The Provincial Nominee Program, a fast track to permanent residence under the jurisdiction of provincial governments that feeds into Express Entry, has had overwhelming interest from international students and graduates in several provinces, leading to long backlogs. In Ontario, the international graduate stream has been on hold since May due to the high volume of applications. Approximately 30 percent of candidates invited to apply to Express Entry are international students, and the federal government expects that to rise to 40 percent under the new changes. At the CBIE conference, Mr. McCallum said further Express Entry changes are coming in 2017 that would grant points to candidates with siblings in Canada and to Francophones. Reforms to Express Entry come at a time of renewed interest by the Liberal government in attracting foreign students to Canadian universities. The CBIE’s 2016 report on international education performance and potential in Canada shows that the number of international students has nearly doubled between 2008 and 2015. More than half of international students surveyed by CBIE in 2015 said they intended to apply for permanent residence in Canada after graduation. Good job but Govt. needs to move faster on this file. Since lack of “Canadian experience” is a major stumbling block for many newcomers, focusing on international students and TFWs for recruiting skilled workers is an obvious alternative. After all, these are (mostly) young people who have studied and/or worked in Canada for years……. they have the built-in “Canadian experience” and would hit the ground running, s to speak. Let us welcome them into our Canadian family in the new year.